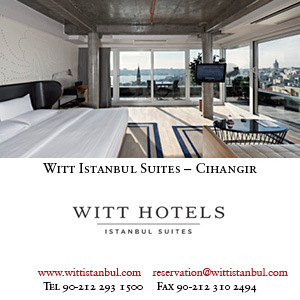 Established in 1989 and beautifully decorated in the spirit of an Ottoman palace. Equally impressive is its traditional Ottoman cuisine. Our quest, after two months’ absence from the Sublime Porte, is to find a taste of Turkey somewhere in London. Quintus, formerly a chef in Martha’s Vineyard and Cambridge and now an acupuncturist, and Margaret, a psychoanalyst, both Turcophiles, suggest the Iznik Restaurant. Thus my wife Frances and I make the long evening trek from Oxford to the fringes of New Labourland. The traffic along the Euston Road on a Friday evening is suggestive of Barbaros Bulvari at any time while the smell of concrete dust and petrol fumes in the air around Angel, Islington, followed by the quaint dilapidation of Upper Street, makes me homesick for Uskudar. 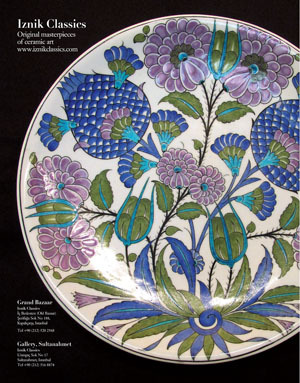 Iznik is a treasure trove of Turcobilia, antiquarian and noveau. Mosque lamps hang in dozens from the ceiling, a forest of ornament. A portrait of Yildirim Beyazit Han, beneath an Ottoman ferman lettered in gold, greets us at the door, and teh walls are covered in tiles and calligraphies. Mezes are brought. Iznik’s patlican salatasi is more in the style of the Levantine variation, baba ghanoush, but this paste of charcoal-grilled aubergine, lemon, parsley and garlic (optional) has the added ingredients of yoghurt, cream and green pepper in place of tahini (sesame paste). Inviting though it is,I remain biased in favour of the original, its seduction more in the Istanbul style: light and subtle. Olives, pickles and white cheese go down in easy accompaniment to our raki and then a bottle of Cankaya 1996, a crisp and fruity white that would shame many a French wine of twice the price (£7.95). The list of starters covers a wide range: some dishes, such as humus and falafel, hinting at a wider Middle Eastern influence. The restaurant does admittedly advertise Ottoman cuisine, and perhaps today this infers a wider ecumenicism of taste than pure enderun mutfagi, palace cooking. Our patron Adem Oner and his wife Pirlanta join us and we learn a little of the restaurant’s background. Adem is from Ordu. An economics graduate from Ankara, he came to England in 1975 as a member of the Turkish embassy staff. Asked what he did there, he wards off such questions with the skilled diplomacy of an experienced restaurateur. Eventually, discovering his long service entitled him to UK residency, Adem and Pirlanta purchased an old workmen’s ‘greasy spoon’ called Mick’s Cafe in Highbury Park. One day a customer, seeing the staff eating nohut and rice, asked why she couldn’t do so too, and gradually English fry-ups made way for börek, dolma and fasulye. Out went the Formica tables and in came pure 1980s Islington brick and wood. But Adem and Pirlanta have not forgotten Iznik’s roots: eggs, chops and beans still feature on the lunch menu. Adem chooses our meal for us - the main course a specially prepared levrek (sea bass) and fener (monkfish) with a light sabayon sauce, served with a potato salad. The fish is fresh, and not overcookecd, the sauce tasty but not obtrusive - and, while not strictly palace, might be allowed in the melting pot of influences in late 19th-century Constantinople. But the humble potato salad, though well dressed, lacked esprit and obviously feels uncomfortable in such lofty, urbane company. Never mind. The restaurant is full by now - ‘and is most of the time’. pipes up Quintus, whose familiarity with the place suggests that he spends a lot of time here, when not sticking needles into people for money. The large menu includes a wide range of familiar, mostly Turkish dishes: zeytinyagli kereviz (celeriac hearts in olive oil), hunkar begendi (smoked aubergine puree), kadin budu kofte (meatballs with rice and herbs, fried in batter), karnyarik (stuffed aubergines with mince, tomato, parsley and pepper). There are some Middle Eastern additions, and some dishes that indicate the term Ottoman is taking on new meanings as Turkish cooks move beyond borders of time and geography. Chicken Iznik - chargrilled chicken breasts (marinated in cream, m ilk, black pepper and olive oil), rice and salad - sounds pure bistro, and must be just what Islington ordered. What we ate, if not purely Turkish, was well prepared, from good ingredients. Quintus assures me he has eaten the most succulent and well-cooked kuzu firin (roasted lamb) on previous visits. We thank the chef, Saim, who has been at Iznik for five years. He hails from Yalova and crossed the Sea of Marmara to cook at the Liman Lokantasi in Istanbul (now newly re-opened, reviewed in Cornucopia 14) before coming to the UK. We too feel that, even if this is not exactly Istanbul, we have made a promising start to our quest, and that if we lived in Islington, Iznik would be the kind of place we would easily make our local.